Since Thanksgiving 2011, when a fire destroyed the interiors of three empty buildings at 4415-4423 North Clark, we've been watching with interest to see what develops. We watched the city condemn them, then we saw them torn down, then we saw an empty lot for a couple years. In spring of 2014, a new development began to go up. Now a reader tells us they're ready for tenants. 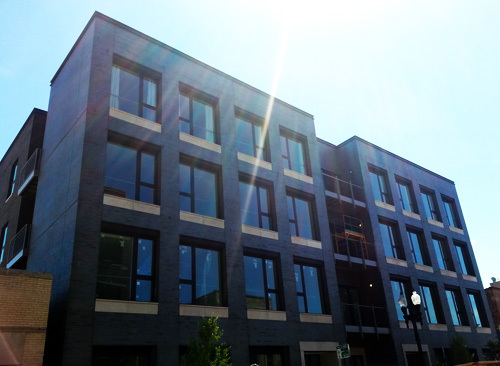 "My husband and I live across the street from the new construction at 4421 N. Clark St. They are advertising market-rate rental apartments that will be available for move-in by August 1. There are 15 units ranging from 2-3 bedrooms, ranging from $2,099-$3,099/month, including penthouse units with private rooftops. I wish I could get commission for forwarding, but I'm just excited to have a new, quality addition to the neighborhood. Our stretch of Clark St. is finally getting some TLC and development.